Can You Have an Overweight Baby? Up until this study, Pediatricians were told they didn’t need to start tracking body mass index (BMI) until 2 years of age. Everyone would say you can’t have any overweight baby, but this new study may prove you can. Now, this new study indicates a strong correlation between BMI as early as six months old, and the risk of obesity as an adult. Doctors calculate BMI using a child’s height and weight and plot the numbers on a graph. Girls and boys are plotted on different graphs to account for their varied growth. Based on this study, researchers from the Cincinnati Children’s Hospital Center can see a correlation between a high BMI and a child becoming obese. The study findings were presented during the Endocrine Society meeting in Boston. The researchers evaluated children from a diverse economic background, which included 783 lean children and 480 severely obese children. 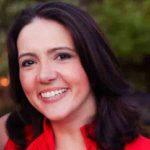 She recommends “Pediatricians start to monitor BMI at 6 months of age and onward,” based on the findings. “We think we really should be more concerned earlier in order to prevent obesity, instead of playing catch up,” Smego told CBS News. Dr. Smego now sees a strong correlation when a child is in the 85th or higher weight percentile at 6, 12 and 18 months old. Parents and Pediatricians need to start monitoring a child’s weight carefully and discussing lifestyle and food changes. If your child is in the 99th percentile in height and 85th percentile in weight still speak with your doctor, but there is probably nothing to be concerned about since your baby is very tall. But, if your child is 60% height and 85% or 90% in weight then speak to your doctor to develop a game plan to possibly adjust some lifestyle and food choices. The goal is to get ahead of your child’s weight at an earlier age. It is easier to tweak a 9 or 12-month old’s diet than it is a 5 or 6-year old’s diet. Obesity can lead to chronic health conditions such as Type-2 Diabetes, stroke, heart disease, high blood pressure and other chronic conditions. 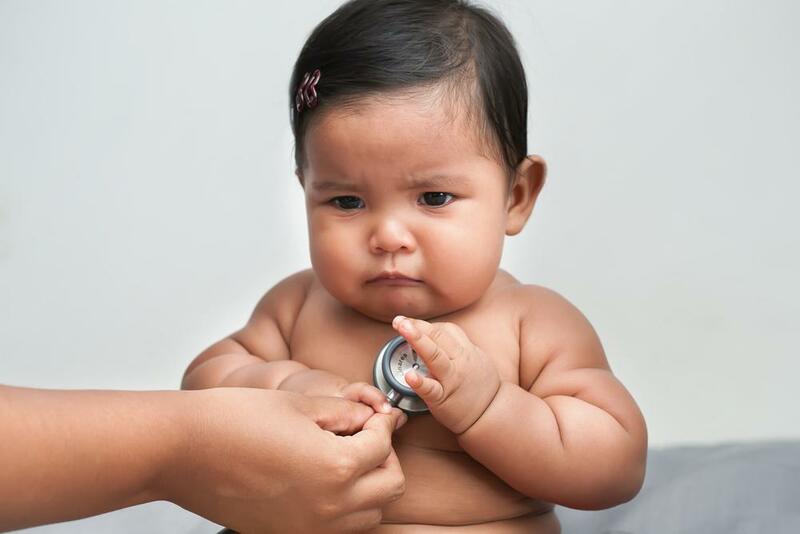 The goal is to help an overweight baby or child maintain a healthy weight to hopefully avoid these health conditions. Is My Child’s Eating Normal at 9-12 Months of Age? Find Out What’s Normal. Develop early healthy habits, while children are most adaptable. Don’t introduce juice to children and if you do, limit it to 4 oz a day. Aim to give babies and small children a large variety of fruits and vegetables, lean proteins, and complex cards. Try to reduce the dependence on crackers, pretzels, Goldfish, and other empty calorie foods. Around 10 months of age, fruit and vegetable consumption goes down and consumption of empty calories goes way up. This doesn’t have to happen! You can prevent unhealthy eating habits in your overweight baby. Try not to over-celebrate your child eating another bite or spoonful of food, so your child doesn’t try to please you by eating everything off his plate. The goal is to teach babies to listen to their internal cues for hunger and fullness. You don’t want to encourage your child to overeat. It can be challenging not to show excitement when your child eats, so try your best and don’t worry about the occasional slip-up. Here is the ultimate guide to introducing solids to your baby to help answer any questions you may have. If you don’t want your child to eat junk food, then don’t bring it into the house. One of the most important things you can do is to model the behavior you want your child to follow. Eat fruits and vegetables in front of your child. Don’t drink soda and other sugary drinks and try to reduce the amount of sugar your family is eating. The goal is to help your child develop a healthy relationship with food. As the parent, you help set the tone for your child’s relationship with food. Follow these great do’s and don’t to get your child to eat more fruits and vegetables. You can do it and we can help! Are you worried about an overweight baby? 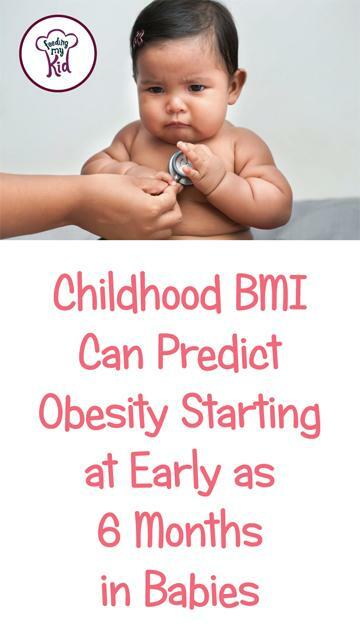 Studies show 85% BMI weight or higher in babies can predict obesity as early as 6 months old.